This post is long overdue, but I have finally rounded up my favorite newborn essentials that helped me survive the first three months of motherhood! These are the items I found to be the most useful and helped make my life just a bit easier during that precious, but hectic newborn stage. I will be doing a separate post featuring newborn essentials for twins within the next few weeks for anyone who is interested in that! 1) Skip Hop Pronto Portable Changing Mat: This portable changing mat is one of the items I have used the most on this list! My friend Melissa told me this was one of the items I needed to add to my baby shower registry and I am so happy I did! This changing mat makes it easy to change your baby’s diaper virtually anywhere. It has a cushioned changing mat, and comes with a refillable wipe case. It says it can carry up to four diapers, but I was able to fit six diapers in the mesh pocket during the newborn phase since they were quite small. If you are going anywhere outside of the house with your newborn, this changing station will definitely come in handy. I always have mine fully stocked and ready to go in their diaper bag. 3) Fisher-Price Baby’s Bouncer: After Arya and Ayla arrived, I quickly realized that I was going to need somewhere safe for them to stay whenever I could not hold them. I ended up ordering this bouncer because it is affordable and has great reviews. This bouncer is very useful, but I wish I had spent the extra money and purchased the more comfortable “taco” looking version (like this one here). However, if you are looking for a budget friendly option, you will definitely get a lot of use out of this bouncer! 4) Baby Shusher: When we went to have the girls’ newborn photos taken at Petite Studios, I was so nervous about how they would react during their photo session. Angelica, the photographer, had an arsenal of tools and tricks for keeping the girls comfortable and happy throughout the session. She had this baby shusher playing white noise in the background and it helped the girls drift right off to sleep. While I use my Amazon Echo to play white noise when the girls nap at home, I take this baby shusher with me whenever we leave the house. It is amazing how quickly this type of sound can calm down a fussy baby. 5) MAM Glow in the Dark Pacifiers: I don’t know what I would do without these pacifiers! Not only do they help calm the girls down when they are getting fussy, they glow in the dark, so I can easily find them without having to turn any lights on at night. Bonus, they are orthodontic pacifiers, which means they are designed to help prevent tooth misalignment and other orthodontic issues as your baby grows. 7) Zip-Up Fleece Footed Onesie: These fleece onesies are super easy to put on, especially with the zipper. They will also keep your baby warm and cozy at night. The newborn size comes with fold-over cuffs, which helped to keep the girls from scratching their faces. 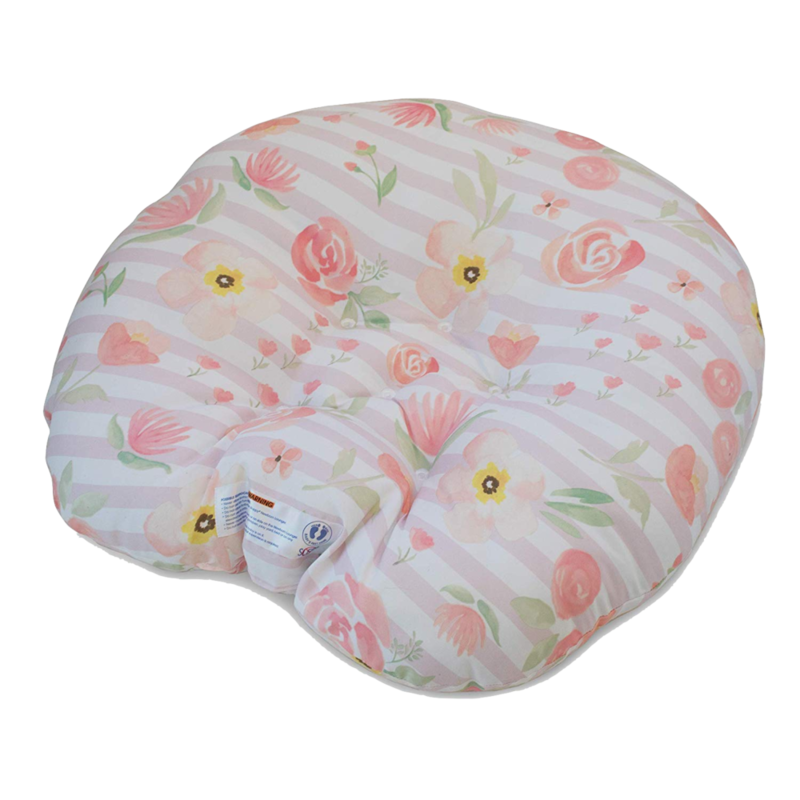 8) Boppy Lounger: This pillow was a lifesaver those first few months! I was told so many times to keep the babies on a firm, flat surface when sleeping, but it honestly just made them cry. Can you blame them? 🤷🏽‍♀️ During their daytime naps, I let Arya and Ayla lounge in their bobby pillows. It’s like a little cocoon for your baby. Although it clearly states on the pillow that they are not intended for sleeping, it was the only place I could get them to rest comfortable. Luckily, I was always nearby and was able to watch them during their naps to ensure their safety. Another lounger that I found they really loved is the Snuggle Me Organic Lounger. It is a bit pricier than the boppy pillow, but incredibly soft, and definitely worth the investment. 9) Oogiebear: This little tool is a must have for babies of all ages! We tried using traditional nasal aspirators, but they just did not work for us. The oogiebear makes it much easier to clean your babies nose and ears, without bothering them too much. If the girls are really congested, we combine it with the Little Remedies saline drops, which I will link below. Also, I thought it might be helpful to mention that the Fridababy NoseFrida nasal aspirator is great too, but it was a little too intense for the girls those first few months. 11) The Play Gym by Lovevery: When I began searching for a play gym, I knew I wanted one that was designed with their physical and mental development in mind, while having enough space for both girls to play on together. I found the Lovevery Play Gym and it checked off all the boxes. It is also one of the more aesthetically pleasing play gyms I found, which is definitely a bonus! 12) Skip Hop 3 in 1 Baby Bath Tub: I’m not sure why, but the thought of bathing our newborn babies made me quite nervous at first. I think this is because I was so uncertain of the way they would react to being in the water and being wiped clean. It turns out, babies love warm water, or at least these girls do! It also helped that this Skip Hop bath tub has a cushioned sling, making it nice and comfy for your baby during bath time. It also grows with baby, so you can use it well beyond the newborn stage. 13) Happ Brand Levy Backpack: I don’t know how I would manage without a backpack style diaper bag. Two of my besties, who also happen to be twins, gifted me this diaper bag at our baby shower, and I am so thankful for it! It is light weight, easy to carry, easy to clean, and I absolutely adore the color! The backpack style allows you to keep your hands free, which every mama need! Plus, the cushioned straps keep you from straining your shoulders, even when the bag is completely full. It is so comfortable to carry and stores so much that I ended up using it as my hospital bag! I am thinking about ordering it in the black color as well, just so I can give the dusty rose one a break.